Healing Arts Veterinary Center is proud to be one of a few clinics in Florida to offer Class IV high intensity laser therapy. Lasers are not new. Class III therapy lasers were first approved by the FDA in the United States in 2002. Class IV lasers received FDA approval in the United States in 2005, but have been used in Europe for much longer. Acceptance has been rapid in human rehabilitation and is slowly on the rise in veterinary medicine. Class IV laser therapy is the use of an intense beam of laser light directed into tissues to reduce pain, increase blood flow, decrease inflammation and promote healing. Unlike previously available Class III cold laser units (power of 500 milliwatts or less), our new laser is capable of producing 12,000 milliwatts (24 times more powerful). This allows us to provide therapy to deep tissues around the hips, shoulders and spine in much less time. 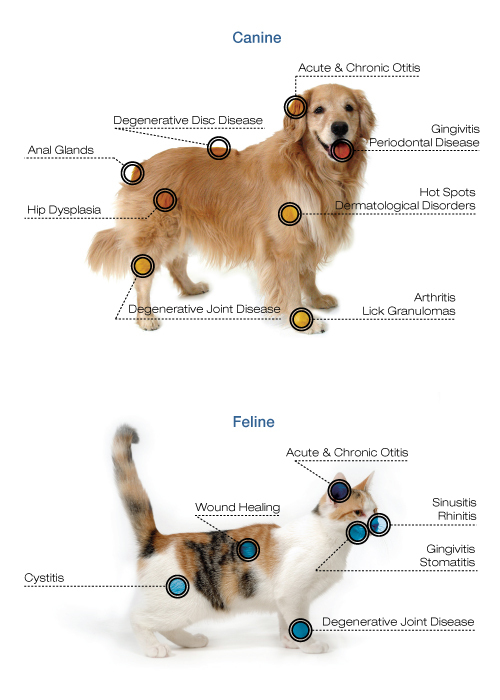 No matter what kind of pet you have, large or small, exotic or domestic, laser therapy can be part or the solution to help ease your pet's pain. Safe and effective, this powerful modality provides increased mobility, increased wound healing, bactericidal activity and post surgery rehabilitation. Visit our page on YouTube to see some of our rehabilitation and laser patients; including Zoe, a quadriplegic dog that was able to walk again after undergoing laser and physical therapy. We will recommend a treatment plan specific to your pet's condition after a consultation and physical examination. The cost of most treatments is $30 to $40 each. Multiple joint treatments can cost up to $65 each.